11th lunar month of 1828: first stage appearance, at the Nakamuraza, where he receives the name of Segawa Tamon II. 1st lunar month of 1832: his father Segawa Kikunojô V dies. 1834 ~ 1839: Tamon goes to Kamigata. He takes the name of Sawamura Kitô* at an unknown date. 1st lunar month of 1840: Kitô goes back to Edo. 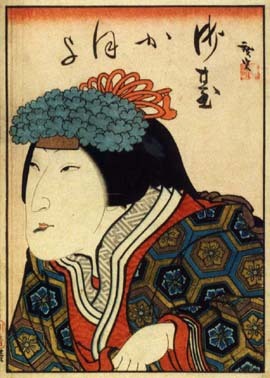 Spring 1840: he is adopted by the actor Nakamura Tomijûrô II. 5th lunar month of 1840: Sawamura Kitô takes the name of Nakamura Daikichi III at the Kawarasakiza, playing the roles of Moronô's wife Taema and the courtesan Kikuno in the drama "Kiwakazari Chûshingura". 1846 ~ Winter 1848: he temporarily helds the name of Nakamura Matsue**. Spring 1848: Nakamura Matsue takes back the name of Nakamura Daikichi III. Summer 1851: tour in Nagoya; Daikichi performs in the precinct of the Wakamiya shrine. 2nd lunar month of 1855: his master Nakamura Tomijûrô II dies. 7th lunar month of 1855: Daikichi goes back to Edo and plays at the Kawarasakiza the roles of Osetsu and Okura in the drama "Chôchidori Kameyamazome". 10th lunar month of 1855: Daikichi survives the earthquake of the 2nd day of the 10th lunar month, which completely destroyed Edo. He decides to take the road back to Kamigata. 3rd lunar month of 1856: tour in Nagoya; Daikichi performs in the precinct of the Seijuin temple. 11th lunar month of 1857: Daikichi appears on stage for the last time, in Kyôto at the Kitagawa no Shibai, playing the roles of Okiku and Oume in the dramas "Sangoku Busô Yakko Ukejô" and "Koi Nyôbô Somewake Tazuna". He suddenly collapses backstage and immediately dies. Daikichi's tombstone is located in the cemetery of the Honjuji temple in Kyôto in the district of Toribeyama. Nakamura Daikichi III could have been the heir of one of the most talented line of Edo onnagata actors but his father unfortunately died too young and he became the sole actor of the Segawa clan. After years of hardship in Kamigata, he received the patronage of the great actor Nakamura Tomijûrô II, who adopted him. He was a talented onnagata actor, who was equally at home in jidaimono or sewamono dramas, but he was not good in speedy lines delivery. He was quite popular but never managed to reach the same level of fame as his father Segawa Kikunojô V.
(*) We believe that he met the actor Sawamura Kunitarô II and became his disciple. Kitô was a haimyô used by both Sawamura Kunitarô I and Sawamura Kunitarô II. (**) He held the name of Nakamura Matsue but was never acknowledged as a regular member of this line. Because he held it after the fourth Matsue and before the fifth Matsue, he may appear on this site as Nakamura Matsue 4.5 on some pages.